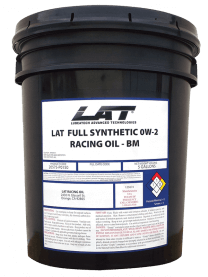 LAT now offers our newest 0W2-BM Ultra Light series oils for serious Racers. Allen Johnson won his first 2012 ProStock Championship season using our advanced blended design to endure high RPM, and high horsepower engines. 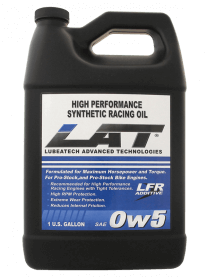 Advance base oils, lighter viscosity, higher shear stable polymer and added additives for maximum horsepower. 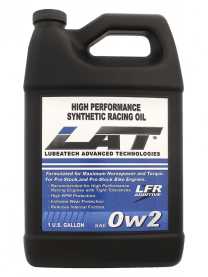 LAT’s Ultra Light series oils are specifically designed to provide maximum film strength for all bearing surfaces. Minimize drag and friction in high performance engines with tight tolerances, without sacrificing horsepower. Excellent ring seal for archiving higher vacuum in a race engine .Excellent valve train protection. Blended with PAO and Esters and LAT’s exclusive LFR additive. Available in 1 and 5 gallon pails, and 55 gallon drums.